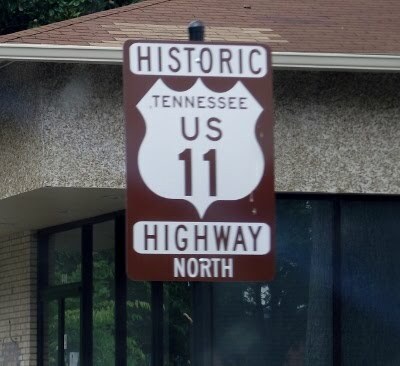 Historic Highway 11 road trip in Southeast Tennessee was the perfect escape for a summer afternoon. This road is small slice of Americana pie and it packs in the seasoning of a slower time. Driving along historic Hwy. 11 in Southeast Tennessee reminded me of our trip along Hwy. 66 in the western U.S. Largely replaced by the faster I-75, Hwy. 11 used to be the major north-south corridor in the U.S. Towns along the route in Southeast Tennessee are small, the people are friendly and the road itself has character that isn't found elsewhere. Part of the appeal of this stop along historic Hwy. 11 is the antique shops. Although there are several, only Southern Heritage Antiques is on the Tennessee Antique Trail. Farmhouse Restaurant serves up meals that's are 'just like mom used to make'. Travel farther south on Hwy. 11 and you'll pass the Bowater paper plant. The air may have a sulphur - type of odor. Some people say it stinks but area residents say that it smells like jobs. This blog will leave it for you to decide. Be careful to watch your speed as you go through this town. Those 35 mph. speed limit signs on Hwy. 11 aren't suggestions! Speed limits are enforced with gusto. The speed helps protect students and the main part of the town. Please pay attention as you drive through Charleston. For big box shopping and national chain restaurants drive on into Cleveland, Tennessee. Department stores, Olive Garden, Logan's Roadhouse and Wal-mart are among the big box chains that are waiting for you to arrive. Continuing south on Hwy. 11 (also called N. Lee Hwy.) into Cleveland. tay on it to get to the Museum Center at 5ive Points. It's on Inman Street just off of the highway. If you like history, the musuem is worth the stop. It chronicles Appalachian regional history from the time of the Native American Indians up to present day. After Keith Street the local name for Hwy. changes to S. Lee Hwy. and becomes known as Lee Hwy in Ooltewah. This is an interesting small town. There are a number of fast food restaurants along Hwy. 11 in Ooltewah and several shops. It's a short but interesting drive from Ooltewah into Chattanooga. The name changes several times. Your best best for following Hwy. 11 here is to use a map. Otherwise, you'll get as lost as I did. The route goes does a little twist in downtown that I still can't explains. Then, it becomes Bailey Ave and takes you to the Chattanooga National Cemetery. From Broad Street in downtown Chattanooga, Hwy. 11 becomes Cummings Hwy. There are signs for Lookout Mountain along this part of the route. This part of Tennessee is steeped in history. I always suggest a side trip to Point Park on the top of Lookout Mountain. The road requires good brakes, a steady hand and a eye for sharp curves. Once you are back on historic Hwy. 11 (Cummings Hwy.) it's not far to the Georgia state line. At this point, it becomes known as Birmingham Pike. And this part of historic Hwy. 11 will become a future blog post.